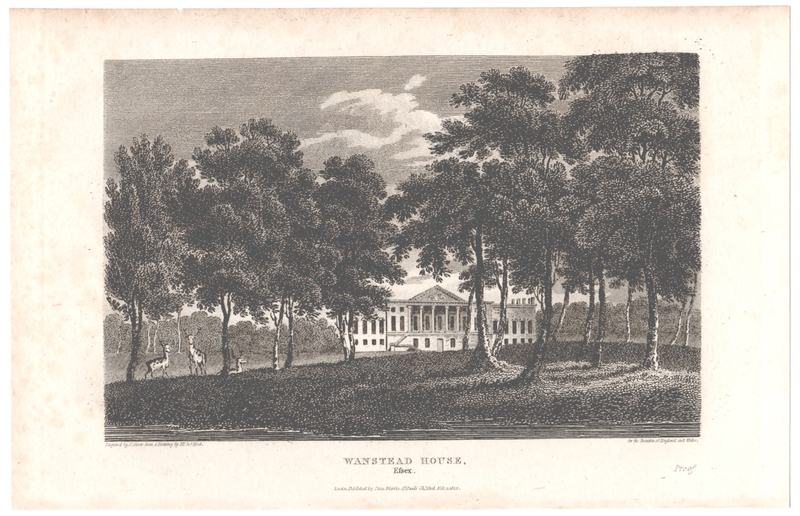 Welcome to this new website which will attempt to reconstruct Wanstead House and its unique and dramatic story from the scattered ashes of time. Here you will find information about the house, its ornamental gardens and the colourful assortment of real-life characters associated with it. In 1822, during a thirty day auction bonanza, the entire contents of Wanstead House from the valuable paintings and sculptures down to the glasses and cutlery were sold to pay off some of the notorious owner William Pole-Tylney-Long-Wellesley's huge accumulated debts. Not long after, Wanstead House, despite being one of the finest and grandest buildings in England, was sold to a firm of builders who completely dismantled it down to and including the basement and sold it piecemeal for building materials. Finely painted interior ceilings with their classical Greek and Roman themes ended up as worthless dust. At the creditors' express insistence, the building was simply erased from the face of the earth with not one brick remaining to mark its former location. The sale of the house raised only £10,000 which was just a fraction of the £360,000 it had cost to build in 1715, when the highest quality craftsmanship and materials had been employed to build a palace fit for kings. For one lady in particular the destruction of the house was one of the final, shattering blows on a road of madness leading from the peak of high hope and fortune to the pit of destitution and despair. A real-life tale of riches to rags in the most dramatic fashion. Catherine Tylney-Long had unexpectedly inherited the Wanstead House estate in 1805. Aged 16 she suddenly became the richest woman in England outside the Royal Family with vast estates and an income of £80,000 a year. She automatically became the focus for a host of would-be aristocratic suitors including the Duke of Clarence, son of the King, George III. Her good fortune started to unravel when she eventually fell for William Wellesley-Pole (nephew of the Duke of Wellington), already notorious among high-society circles of the time. A womaniser, gambler, debaucher, scoundrel, you name it, he had all the hallmarks of the classic archetypal villain. Explaining why she went for him is difficult but such a man would have been an expert in charm and manipulation and Catherine may have regarded his notoriety as endearing or charismatic. However, since a woman's estate automatically passed to her husband upon marriage, by agreeing to marry him, she was putting her fate completely in his hands. The wedding in 1812 at St.James's Church, Piccadilly was a major society event. The bride wore a lace bonnet decorated with ostrich feathers, a dress of the finest satin and lace, a necklace worth 20,000 guineas (perhaps one million pounds today) all as befitting a lady of her wealth and status. The bridegroom was more simply turned out in a blue coat, with white waistcoat and stockings, buff breeches and buckled shoes. A local jeweller had to be scrambled when it became apparent that the bridegroom had forgotten to bring the ring. The next morning the happy new couple moved into Wanstead House where the staff and local villagers and dignatories had gathered to greet them. Clearly having married for money and with the prize now won, Wellesley-Pole first incorporated the new titles into his own name - William Pole-Tylney-Long-Wellesley. Not one for the quiet life, he busied himself with gambling, throwing lavish parties at the House and general high living. His honeymoon with the locals was short-lived. Within a year he had been forced by the courts to reopen the park after he had tried to close it to public access, a right always enjoyed to date. Next was the unpopular mass timber-felling, which he seems to have had a particular fondness for. Money really did grow on trees. In one of the other Tylney estates passed to his control by the marriage, it is said he had the manor house demolished to get around a clause which stipulated that timber could not be felled within sight of the house. In the meantime, Catherine was sidelined and mistreated by him, probably increasingly so as difficulties multiplied. Within 10 years of the marriage he had managed to squander her entire fortune. He fled the country in a boat up the Thames pursued by his creditors who then seized Wanstead House. The House and its contents were broken up, the three children were made wards of chancery and Catherine Tylney-Long was left destitute. She died in 1825 in Richmond, Surrey reportedly 'of a broken heart' at the age of 35 having lost everything. After returning to England, Wellesley-Pole tried his luck again in 1828 when he married another independently wealthy lady. In 1847 she had to apply for Poor Relief. He was only saved from starvation himself when the Duke of Wellington allowed him a small yearly pension during his final years. The despised and shunned Wellesley-Pole died impoverished in 1857 'without a flicker of remorse' and 'mourned by no-one' . When Catherine and William's last-born daughter Victoria died childless in 1897, the once proud and powerful Tylney-Long family and their legacy finally passed away for all time into history.